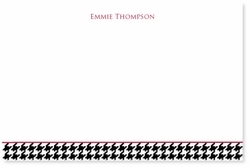 Houndstooth Note Card from Pink Peppermint Paper, LLC. Enter name to be printed: Oh phooey! This item is currently out of stock.